Pontifex is 50% off for one day only! Chronic Logic announces Pontifex is 50% off for one day only! March 18th, 2008 - Santa Cruz, California - For the 24 hours of March 18th you can get the award winning bridge building game Pontifex for only $9.95. Chronic Logic and Game du Jour are proud to offer Pontifex this discounted price. This special price will only be good during March 18th through Game du Jour (http://www.gamedujour.com). On March 18th be sure to check out http://www.gamedujour.com for One Day, One Game, One Incredible Deal, Pontifex for only $9.95. If you have been waiting to get the full version of Pontifex now is your chance, If you know someone who might be interested please let them know. Once again this deal will only be good for 24 hours so don't miss out! 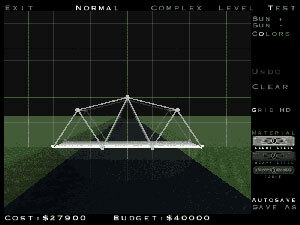 Pontifex is a bridge building game in which you designs and tests bridges. Pontifex uses a complex physics engine which allows the construction of many different types of bridges. Once the design is completed, you can test the strength of the bridge by sending a train across it. Depending on the quality of the bridge's design, the train will either pass over it safely or plummet into the river below. The 3D engine lets the player view their bridge from any angle, including a first-person train view. Many different levels are included, from simple to complex, and a level editor lets you make your own levels to trade with other people. Game du Jour, launched in December 2006, is the first company in the world to offer one deal a day in the indie and casual PC games market. While the company aims to be best known for its daily deals, Game du Jour is at its core a marketing partner to game developers, giving those companies the opportunity for a rush of sales and heightened brand exposure during their products' 24-hour life cycle at GameDuJour.com. For more information about Game du Jour, visit http://www.GameDuJour.com/about-us.